If I wanted to perpetuate a stereotype, I could start off this week’s column with some attempt at humor by noting that Northeast Tennessee has seen more than its share of “rednecks” in recent weeks. No, I’m not talking about the NASCAR fans gathered this weekend at Bristol Motor Speedway! Of course, in this context I’m referring to a species of grebe that recently staged a remarkable late winter invasion of area lakes and ponds in record numbers. 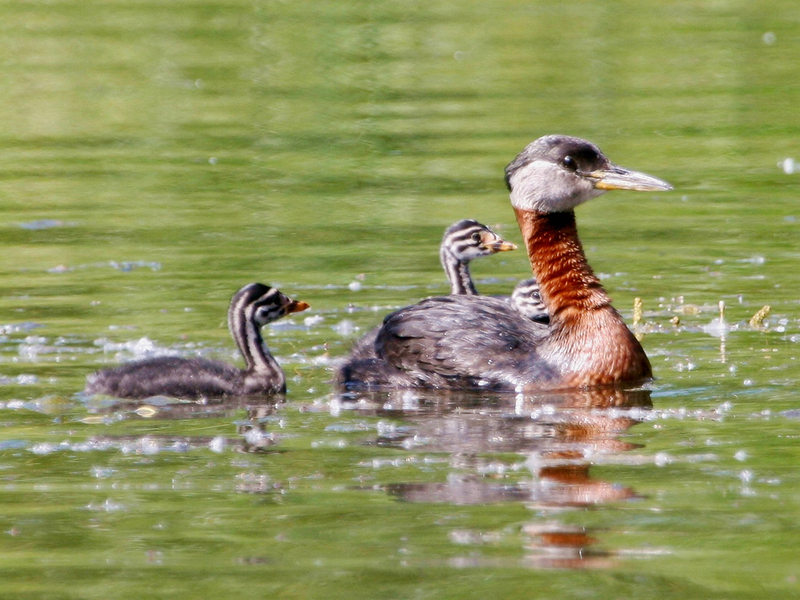 A Red-necked Grebe with young is shown on an Alaskan wetland. Last year, I saw a total of one Red-necked Grebe. Only three months into 2014, I have already seen more than a dozen of these grebes. Although usually rare visitors to Northeast Tennessee, the unusual weather conditions that have already brought such uncommon birds as Long-tailed Ducks, Canvasbacks and Common Mergansers to the region seems to have also resulted in unusually high numbers of Red-necked Grebes in early March throughout the Volunteer State. The most common grebes for Northeast Tennessee are the Pied-billed Grebe and Horned Grebe. 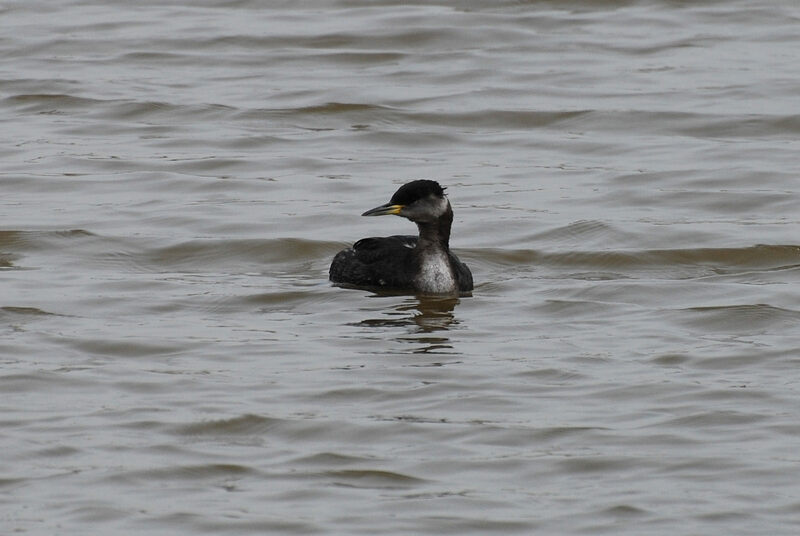 Another species, the Eared Grebe, is an annual but uncommon visitor to South Holston Lake. The Red-necked Grebe has been reported slightly more often than the Western Grebe, which is known from only a handful of records. In 2012, I added Western Grebe to my state list when I observed this bird at Musick’s Campground at South Holston Lake in late November. The recent influx of Red-necked Grebes in the Volunteer State record numbers of these birds on various lakes and ponds. The grebes began arriving on March 4. Rick Knight found 25 Red-necked Grebes found near the dam on Boone Lake. The total of 25 Red-necked Grebes is a Tennessee state record high for that species. The record didn’t remain in place long. Two days later, Wallace Coffey and Jim Ratchford found 101 Red-necked Grebes on Boone Lake and nine more of these grebes at Fort Patrick Henry Dam. Sightings have continued from throughout the state, as postings on the Tennessee Birds and Bristol Birds email groups documented the fallout of Red-necked Grebes. Bryan Musick observed and photographed a Red-necked Grebe on March 5 on Oxbow Lake in Castlewood, Va., in Russell County. Ron Hoff and Dollyann Myers of Clinton, Tenn., reported a Red-necked Grebe on March 13 at Lenoir City Park, in Loudon County. Susan Hubley of Rogersville reported a single Red-necked Grebe on John Sevier Lake in Hawkins County on March 15. Red-necked Grebe reports also came from Chickamauga Lake, Douglas Lake, Melton Hill Dam and Trout Lake along the Blue Ridge Parkway in North Carolina. I visited Shook Branch Recreation Area on Watauga Lake with my mother on March 5. We found at least a dozen Red-necked Grebes on the lake, as well as a couple of Pied-billed Grebes. All the grebes were too distant for photographs. The next day, however, Tom McNeil reported a Red-necked Grebe on the large pond on the campus of Northeast State Community College in Elizabethton. 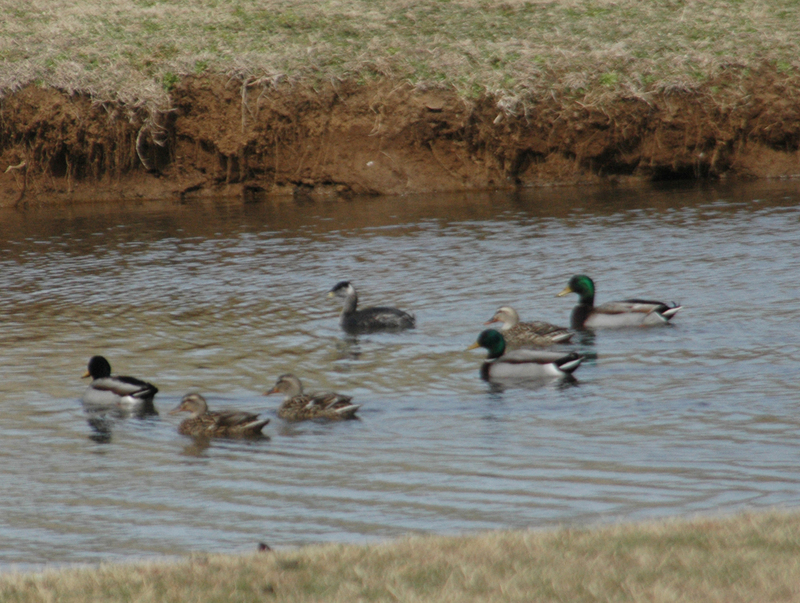 A Red-necked Grebe mixes with Mallards at a pond on the campus of Northeast State Community College in Elizabethton. My mom and I visited the pond and enjoyed seeing one of these grebes at much closer range. For much of the time, the out-of-place grebe mingled with the Mallards in residence at the pond. The Red-necked Grebes that have been visiting Tennessee are likely migrants on their way to summer nesting areas on large freshwater lakes, marshes and other inland bodies of water. This grebe spends the winter on the open ocean or on large lakes. These aquatic birds feed on a varied died of fish, crustaceans and aquatic insects, as well as some mollusks and amphibians. The Red-necked Grebe is a rather plain-looked grey bird during the winter season. This bird acquires the distinctive red neck during the breeding season. Males and females look alike. They also sport a black cap and a pale grey face when in their breeding plumage. Like many grebes, the Red-necked Grebe stages an elaborate courtship display and a wide range of loud mating calls. This Red-necked Grebe was one of many observed by birders throughout the region when an unprecedented fallout of this species took place in the first week of March. Although the bird variety is rare in Northeast Tennessee, “red-neck” birds abound around the world. Some other species would include Red-necked Stint, Red-necked Spurfowl, Red-necked Nightjar, Red-necked Amazon, Red-necked Avocet and Red-necked Phalarope. Actually, the last bird on the list is also an occasional visitor to Tennessee. The others are spread out around the globe. Worldwide, there are 22 species of grebes. This family also includes three extinct species — Alaotra Grebe, Atitlán Grebe and Colombian Grebe. These birds range in size from the Least Grebe, which weighs only about six ounces, to the Great Grebe, which can tip the scales at four pounds. Other North American grebes include Red-necked Grebe, Eared Grebe, Clark’s Grebe and Western Grebe. During visits to Utah in 2003 and 2006, I observed the sleek, long-necked Clark’s Grebe and Western Grebe. On my 2006 trip to Utah, I visited Antelope Island State Park and observed tens of thousands of Eared Grebes gathered on the Great Salt Lake for the nesting season. The grebes most often found in Northeast Tennessee are Pied-billed Grebe and Horned Grebe. In addition, a small number of Eared Grebes have wintered on South Holston Lake in Sullivan County for many years. Despite the unusually high numbers so far this year, the Red-necked Grebe is only an uncommon winter visitor to the region. I’ve previously observed this grebe on Boone Lake, South Holston Lake and Watauga Lake. A week after a female Red-winged Blackbird visited my feeders on March 8, a male Red-winged Blackbird arrived at the fish pond. He immediately claimed a perch in a tall tree and began singing loudly to announce his arrival. This entry was posted in Uncategorized on March 16, 2014 by Bryan Stevens.